President Trump's early-morning tweets about Russia ahead of a one-on-one meeting with Russian President Vladimir Putin weren't appreciated by 'Fox & Friends' host Brian Kilmeade. Ahead of a one-on-one meeting with Russian President Vladimir Putin, President Trump ripped former President Barack Obama and an investigation into the 2016 presidential election in a series of early-morning tweets that even a Fox & Friends host criticized. "President Obama thought that Crooked Hillary was going to win the election, so when he was informed by the FBI about Russian Meddling, he said it couldn't happen, was no big deal, & did NOTHING about it," Trump wrote on Twitter from Helsinki, Finland, the location of his meeting with Putin. In a second tweet, Trump blamed years of "foolishness and stupidity" on the part of the United States for its poor relationship with Russia, ignoring Russian hacking ahead of the 2016 election and Moscow's invasion of Ukraine and annexation of Crimea. Trump also once again referred to the special counsel Robert Mueller's investigation as a "rigged witch hunt," despite Friday's announcement of 12 new indictments against Russian intelligence officers suspected of hacking into and releasing emails during the election in order to undermine the campaign of Democratic presidential nominee Hillary Clinton. 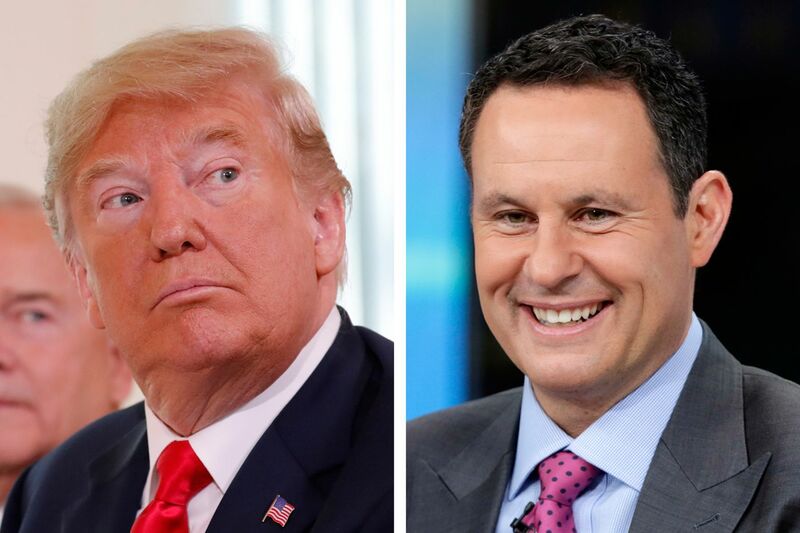 Among those who criticized Trump's tweets was Fox & Friends host Brian Kilmeade, who is usually among the president's most ardent supporters in the media. Kilmeade, discussing Trump's tweets ahead of his meeting with Putin, called the president's comments "ridiculous" and "insulting to past administrations." "That's by far the most ridiculous tweet of late, and that is insulting to past administrations," Kilmeade said on Fox and Friends Monday morning. "He can't be saying that going into the Russian summit." Kilmeade was far from alone. Sen. Ben Saase (R., Neb.) also called out Trump's tweets, suggesting that instead of attacking the actions of the United States, the president should instead declare Russia the "enemy of America and our allies." While Trump's early-morning tweets had many critics, the Russian foreign ministry voiced its support of the president's comments in a two-word response, writing, "We agree." Trump told CBS News he could ask Putin about extraditing the 12 Russian intelligence agents indicted as part of Mueller's investigation, but admitted, "I hadn't thought of that." But during a brief exchange alongside Putin in front of reporters ahead of their one-on-one meeting, Trump didn't indicate any discussion of Moscow's interference in the 2016 election was on the agenda. "Our two countries, frankly, we have not been getting along well," Trump said. "I really think the world wants to see us get along." Kilmeade's comments come just a day after former Fox News reporter Carl Cameron claimed Trump was "still colluding" with Russia despite the attack on the U.S. election system and attempts to sow political discord in the United States. "Whenever the president denies the entire idea of Russian interference in U.S. elections — and labels investigations into such interference a hoax or witch hunt, he is enabling the biggest cyberattack in U.S. history," Cameron told the left-leaning news website ThinkProgress. Monday's meeting between Trump and Putin went forward despite condemnation from both parties after the latest round of indictments was released, which alleges that 12 Russian intelligence officers hacked the Democratic National Committee, the Democratic Congressional Campaign Committee and Hillary Clinton's campaign, and released emails under the names DC Leaks and Guccifer 2.0, with the intention of impacting the results of the 2016 presidential campaign. "President Trump must be willing to confront Putin from a position of strength and demonstrate that there will be a serious price to pay for his ongoing aggression towards the United States and democracies around the world," Sen. John McCain (R., Ariz.) said in a statement. "If President Trump is not prepared to hold Putin accountable, the summit in Helsinki should not move forward." Trump is scheduled to hold two interviews from Helsinki, with Fox News hosts Sean Hannity and Tucker Carlson. Putin is scheduled to sit down for an interview with Fox News Sunday host Chris Wallace. The network landed the exclusive interviews following the administration's addition of ousted Fox News executive Bill Shine, who joined the White House earlier this month as deputy chief of staff for communications, despite allegations he help cover up incidents of sexual abuse and harassment by former Fox News chairman Roger Ailes. While the meeting between Trump and Putin is taking place behind closed doors, the two leaders are scheduled to hold a joint press conference at 9:50 a.m. Eastern time.